Million Bells® is the brand name given to a particular range of trailing petunias with mini flowers. Million Bells® have been bred to produce branching plants which are neat trailers. They produce masses of flowers which are about the size of a ten pence piece. They are not as vigorous as full size trailing Petunias, and a result produce a very neat ball of colour in hanging baskets. They can also be used in patio containers. 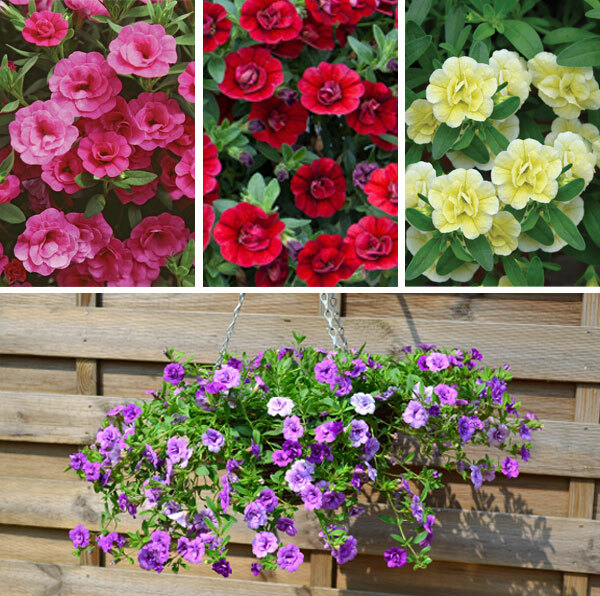 To fill a 12″ or 30cm hanging basket you will need 5 plug plants. You can read our step by step guide to planting a hanging basket here. Be careful of using Million Bells® in mixed baskets with vigorous plants such as Giant Fuchsias or Lobelia, as the Million Bells® will get lost! Trailing Million Bells® are available in Blue, Fuchsia, Ice White, Red and Yellow. The Mini Famous® range is similar to Million Bells® but has double flowers. They also look wonderful in hanging baskets, producing a ball of colour. To fill a 12″ or 30cm hanging basket use 5 plug plants. Million Bells® can be difficult to get established as they have fine roots. Plant the plug plants into small 9 or 10cm pots to allow the roots to establish. When growing your Million Bells® plugs, be really careful not to overwater them as they will become waterlogged. Keep the compost moist not soaking wet. We’ve found that our Million Bells® have grown well when we have added a handful of ericaceous compost into the multipurpose compost. Once your Million Bells® are ready to plant out in the garden, position them in sun or partial shade. Feed them weekly whilst in flower with a multipurpose feed. Watering is best done in the mornings or evenings rather than when the sun is at its strongest, to avoid scorching the leaves. New Guniea Impatien Harmony® Radiance Pink – New for 2014! Verbena Lanai™ Blue Twister – New for 2014! previous post: New Guniea Impatien Harmony® Radiance Pink – New for 2014!